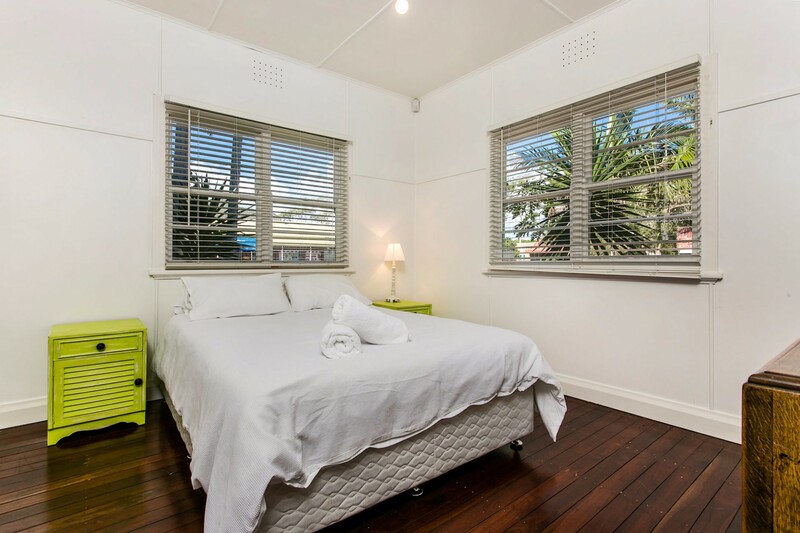 When location is paramount, Frankie’s Beach House has got it nailed! 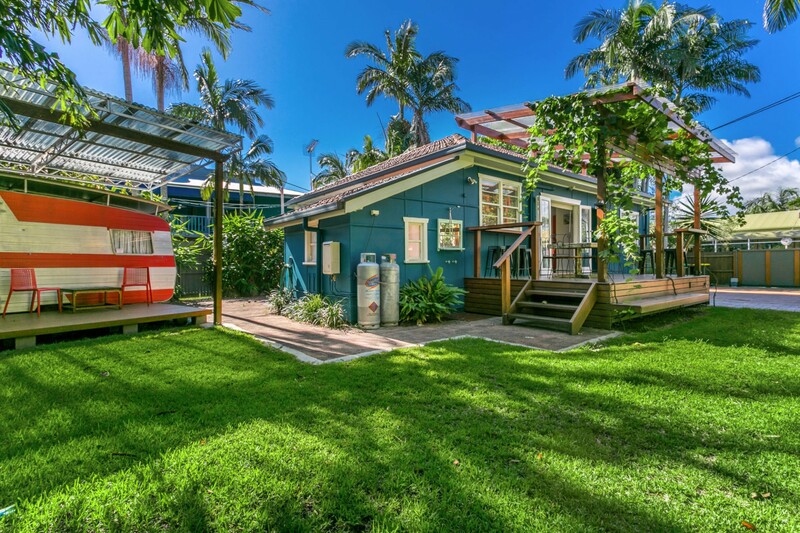 Just 500m from Byron Bay Main Beach, this fun holiday rental welcomes groups of up to 10. 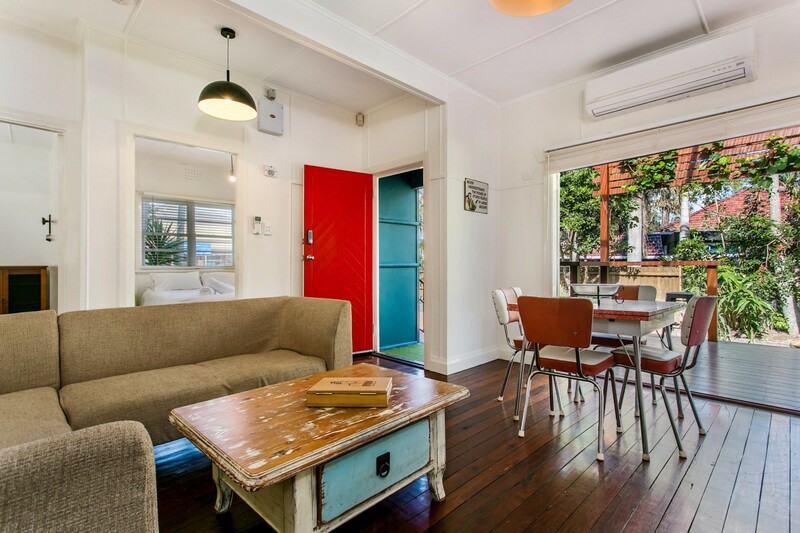 The renovated house is a blast from the past with vintage-style furnishings and retro-red décor. 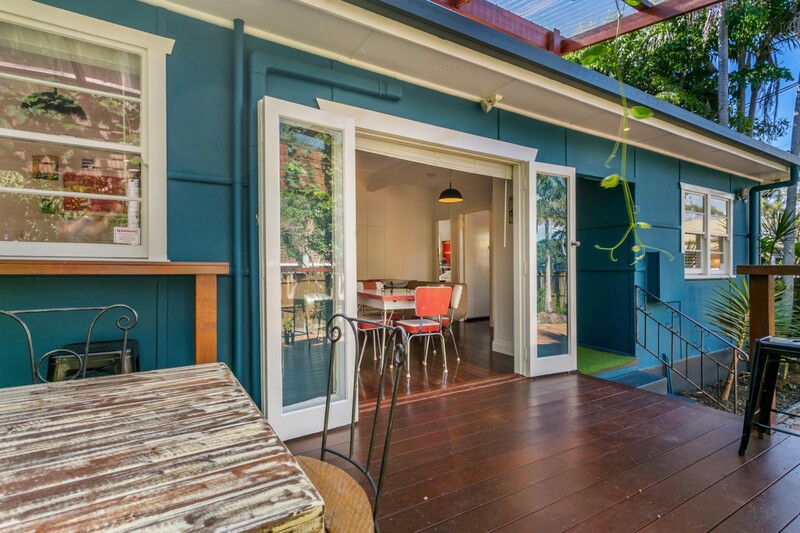 The open-plan living/dining area flows out onto the covered deck through bi-fold doors. The modern kitchen is fully equipped for handling breakfast and more. Gather together in the evening for a burger and steaks flame-grilled on the beer-barrel BBQ. 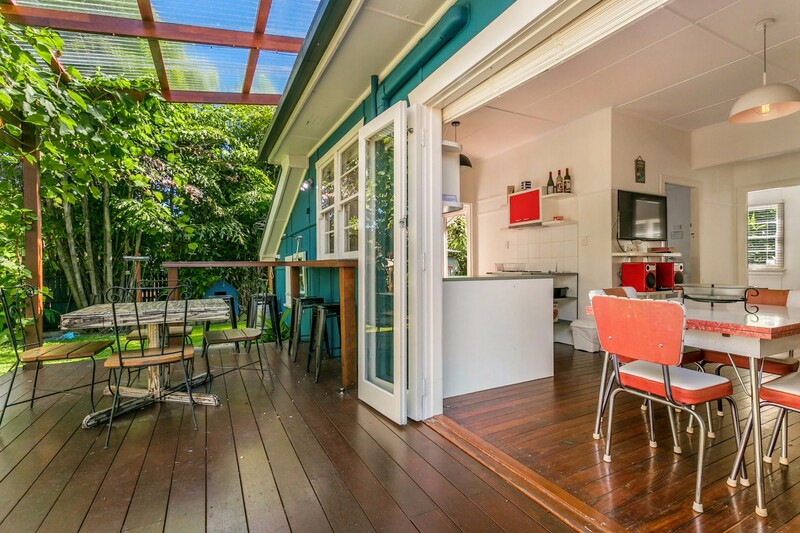 The spacious deck with its bar-style tables and stools adds to the outdoor fun. 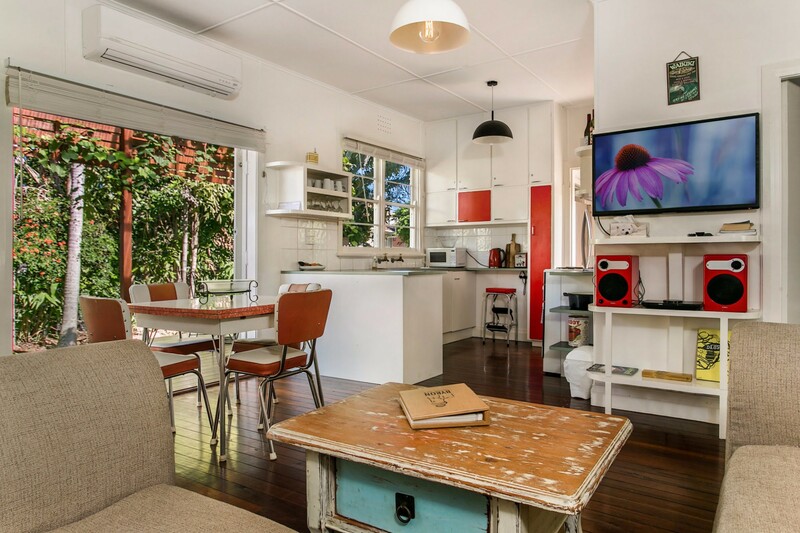 Spread out in 4 spacious bedrooms and 2 bathrooms in the main house or plump for the renovated retro caravan for two in the yard. It has its own kitchenette, fridge and deck. There’s off-street parking and even a kennel in the fenced yard for your dog! 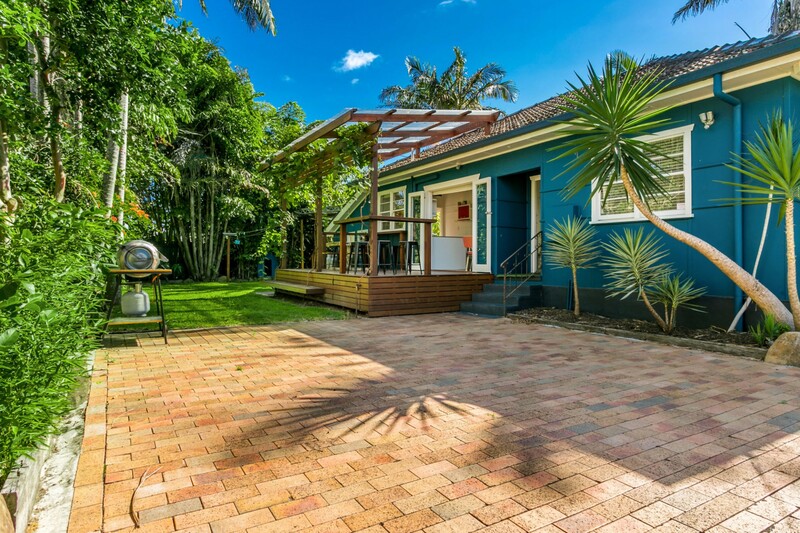 If you’re looking for an unforgettable holiday rental in Byron just a stroll from everything, look no further. 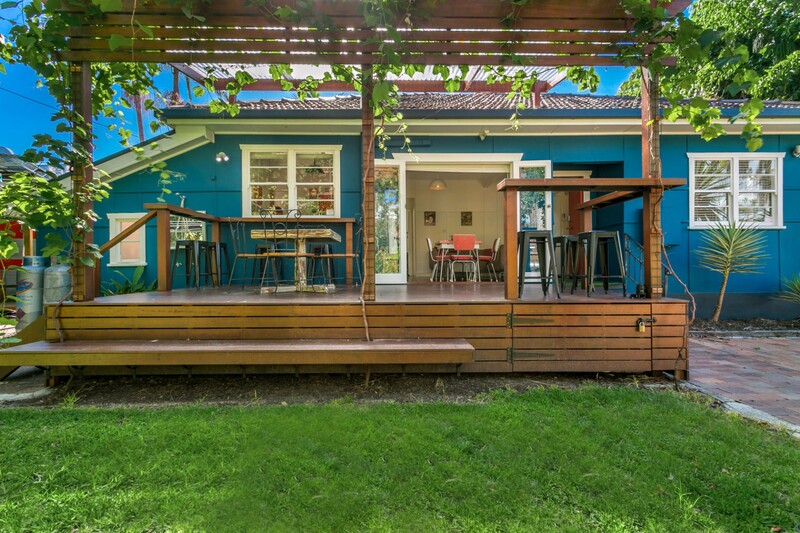 Groups, families and schoolies are welcome at Frankie’s Beach House and are sure to have a blast. The compact living room has sofa seating for relaxing and sharing a movie with popcorn. There’s a vintage coffee table to complement the retro style of the red and cream dining set. The table easily extends to accommodate larger parties. 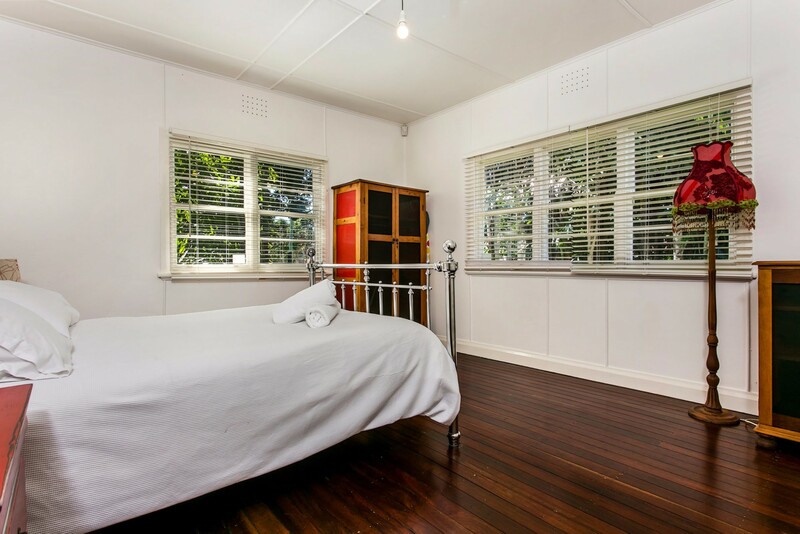 Wood flooring and white walls give a clean bright ambience. Bi-fold doors bring the outdoors into the dining/living room for fresh sea air. 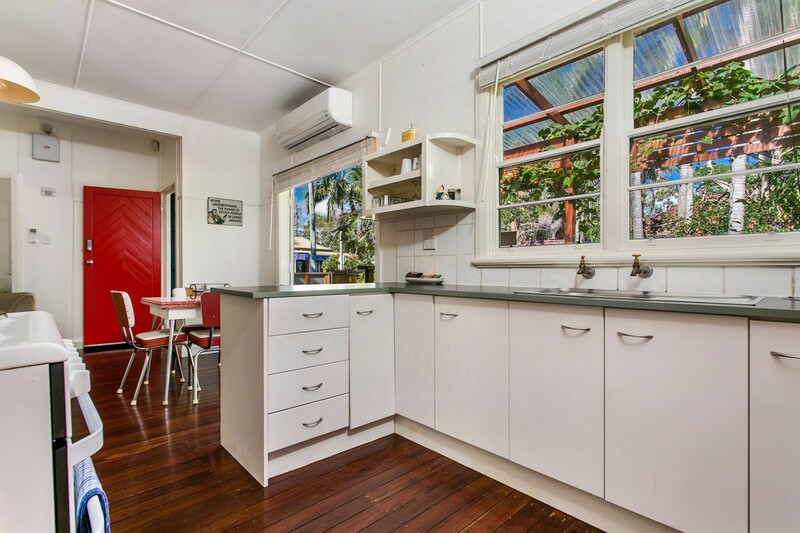 The modern open-plan kitchen has everything you need for whisking up a meal in minutes for hungry surfers and beach fans. Stock the refrigerator with cool drinks, load up with snacks from the nearby grocery store and you’ll have a wonderful time chilling out at Frankie’s. Main house has 4 bedrooms plus two single beds in the caravan. 2 single beds with kitchenette. 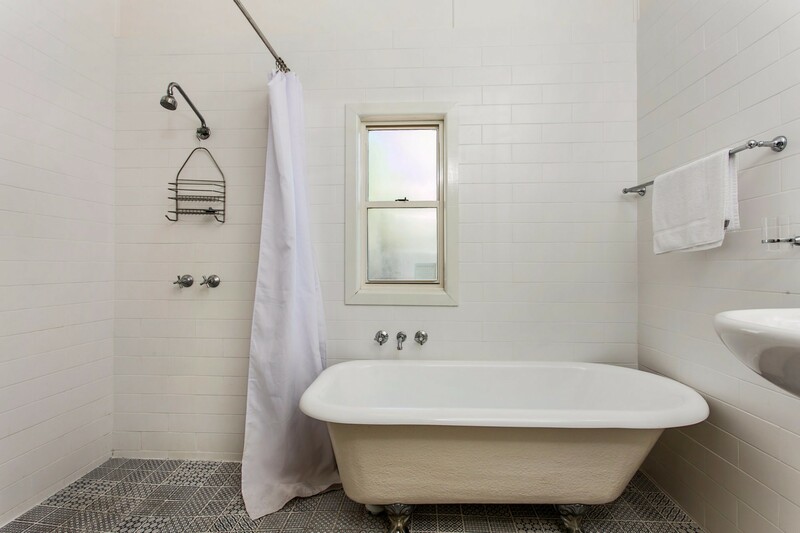 Two bathrooms – one with separate bathtub and wet room shower. There’s also a hot and cold shower on the yard for rinsing off outside after a day at the beach. 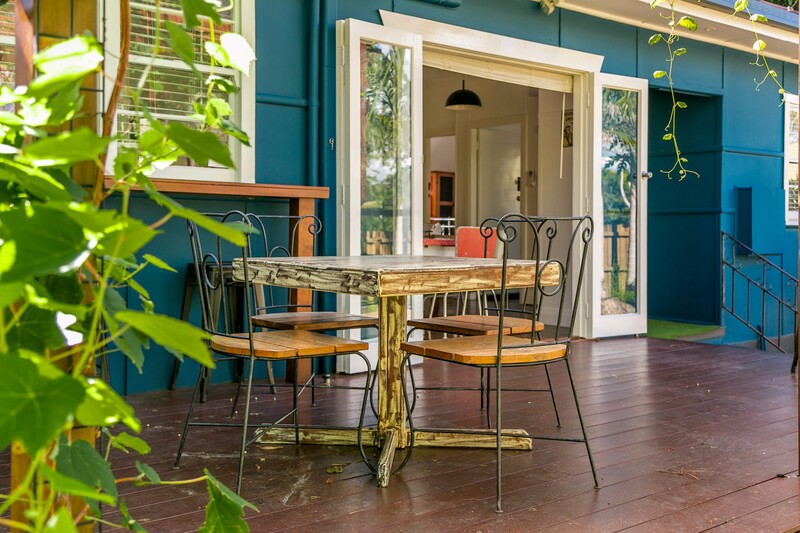 Steps out through bi-fold doors onto the covered outdoor deck which has a table and chairs for dining or playing cards in the leafy suburban garden. There are several breakfasts with stools for sitting with friends as part of the larger group. 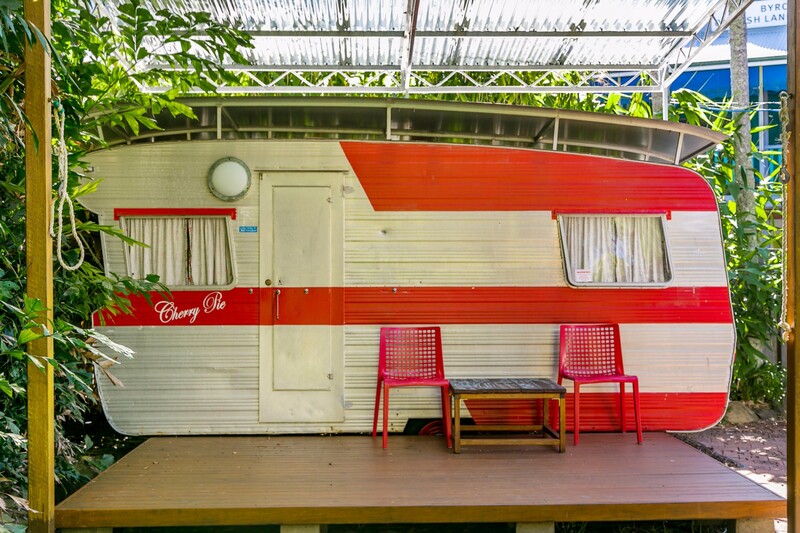 Adding to the fun setting, the retro caravan sits in the yard surrounded by greenery offering a quiet retreat with its own private deck. Fire up the beer-barrel barbie on the paved yard and let the party begin! 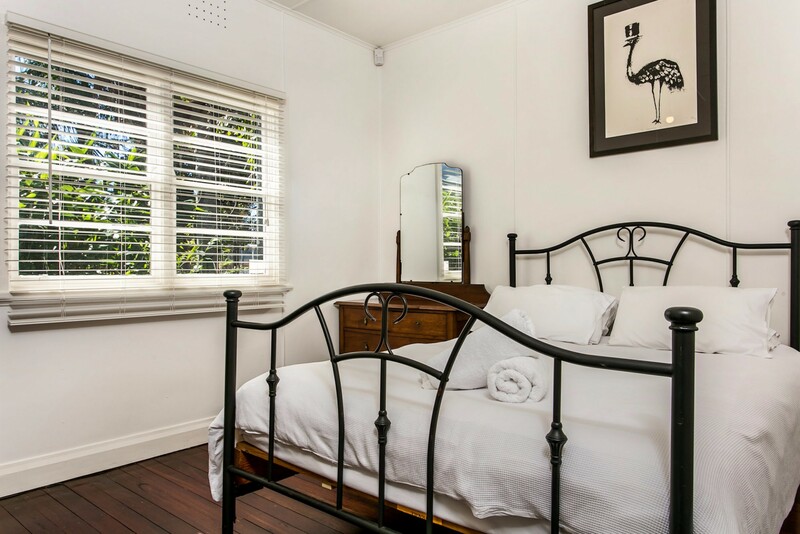 Centrally located in Byron Bay town, Frankie’s Beach House is close to cafés for breakfast, bars and restaurants for nightlife, and general shops and grocery stores. 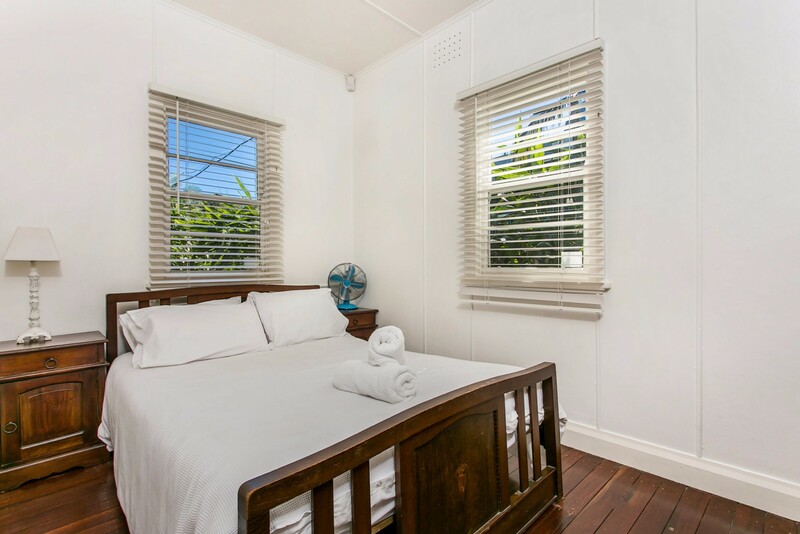 Byron Main Beach is just 500m away for carrying your surfboard and lounge chairs. Tallows Beach offers a quieter alternative, just 5 minutes by car. It is part of the Arakwal National Park, a preserve for wildlife and birds. Early birds can enjoy a bracing walk or jog around Cape Byron to the lighthouse along the Walking Track just minutes from the door. 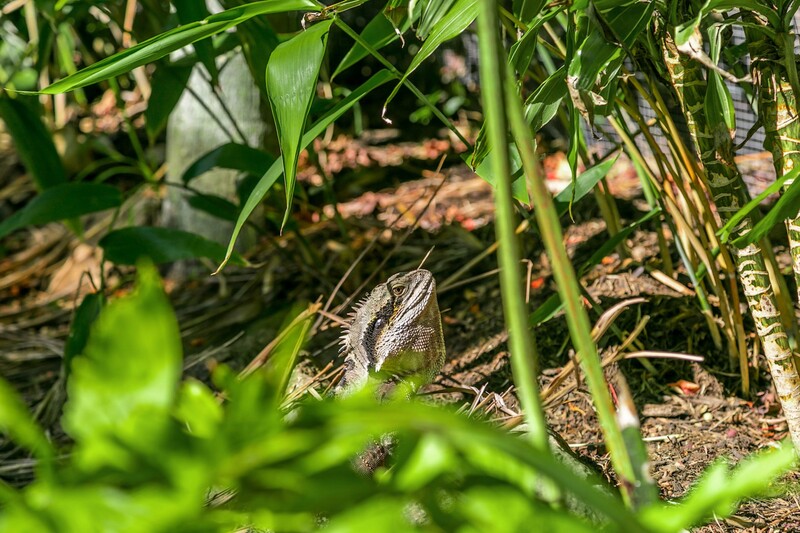 Pause to look for migrating whales and dolphins from Fisherman’s Lookout or from the tip of the cape, the easternmost point of mainland Australia. Gold Coast Airport is 67km and Ballina/Byron Airport is just 33km. Great location to the house right in the middle of the town, and the house was decorated - really nice! Thanks so much for letting us stay at your gorgeous house. We absolutely loved it. This house was incredible. Very comfortable for all of us and we all loved the style. The caravan out the back was perfect for the kids and having 2 full bathrooms was great as there were quite a few of us. The location is exceptional. .right in the heat of Byron with awesome cafes right around the corner and woolworths across the rd. A couple of the nights were a bit loud with a party next door at the English school or just people on the street but it was all over by a reasonable time. I would highly recommend this house. It is beautiful, comfy and spacious. We loved it. Things we appreciated about our stay were being able to enjoy a selection of beautiful beaches and having them all within walking distance. The Pass was a particular favourite. We also enjoyed being able to walk to restaurants and shops on the main street. On the second night there was an event nearby. After enduring the noise from before 7pm until 11pm, we decided to call the Noise Pollution hotline who were very quick to respond end eventually the music was shut down.